I have been very fortunate this school year. I've been able to add an instamatic camera, three DSLR cameras with telephoto lenses, and 36 Chromebooks to my classroom. One of my students recently asked me, "Wheredya get all the money for this technology?" 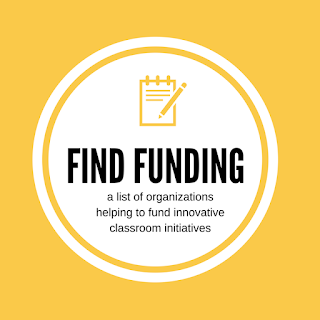 At least once a week, I'm scouring my network for new grants and initiatives to help bring resources into my classroom. I spend at least one of my planning hours each week either researching or writing grants to bring the outside into my class, whether that be through hardware, speakers, or virtual connections to experts in areas we are studying. I am passionate about making sure that what happens inside my classroom walls connects with what is happening outside of them. To do this, I rely on a network of organizations that help provide funding for such initiatives. In addition to my student, I've also had a couple of teachers in my district ask the same question: "Where did you find the funding?" So I thought I would share some of the resources and organizations that have supported my classroom, as well as share links to a few promising awards that I've recently become aware of. As I learn of more, I'll update this post. And if you know of any, please share! Use the comment section below to add any links you think other educators should know about. DonorsChoose.org is a site where teachers can post projects for which they are seeking financial support. Donations come in from individuals as well as from larger corporations and organizations. Last summer, Staples supported a large number of projects as did the Bill and Melinda Gates Foundation. Recently, athletes, artists, and philanthropists funded a hundreds of projects through the #BestSchoolDay initiative. This is a well-used, well-organized space, but the downside is that if you do not reach your funding goal, you lose all the money donated towards that goal. PledgeCents.com is a lot like DonorsChoose, but with one big difference. Teachers keep all the money raised for a project. So, even if the project doesn't reach its funding goal, say you only raise $125 of the $200 you were seeking, you keep the $125 you've raised. Being a Google Certified Innovator (formerly known as a Google Certified Teacher) links you in to a whole community of innovative educators from around the world. Our online communities are a place where we regularly trade cool tools, tips, and of course, grant opportunities. And you can join, too! Applications to participate in the June 2016 Google Innovator Academy open on April 5th. As a member of Pennsylvania Association for Educational Communications and Technology (PAECT) and Michigan Association for Computer Users in Learning (MACUL), I receive a regular newsletter in my inbox which shares upcoming grant opportunities - Big Deal Media. You can sign up for free without having to join either of these organizations. 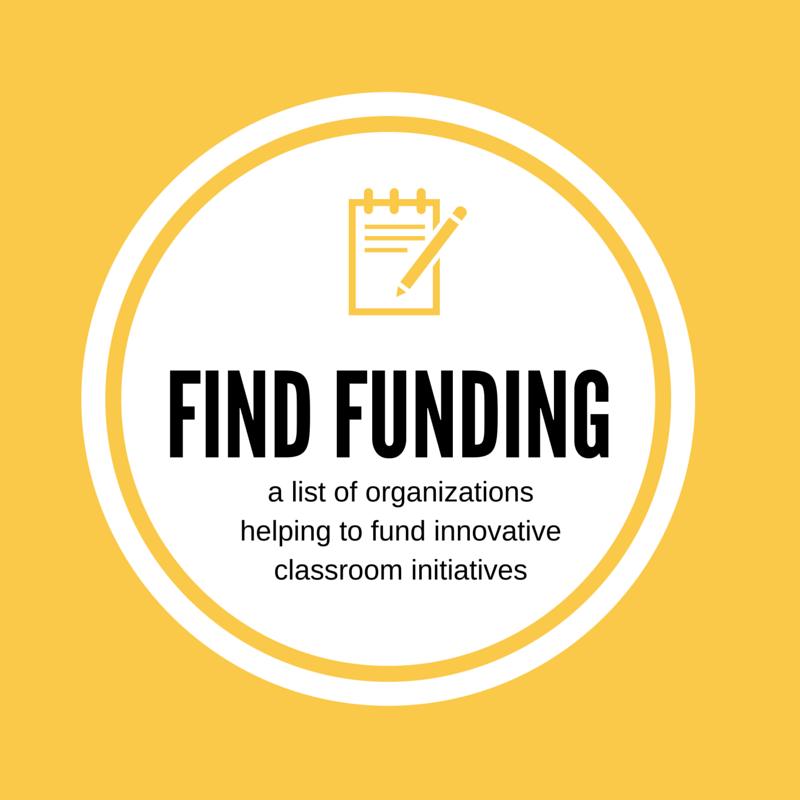 GetEDFunding tracks a huge list of grants and awards for educators. Create a free account and select your experience and interest areas in order to receive a personalized list of grants your classroom may be eligible for at the state and national level. And this post by Edutopia contains a wealth of advice and links. Make sure you save this post to go back to again and again. For local Grand Rapids area teachers, the Grand Rapids Community Foundation is a fantastic resource. This group oversees a number of organizations and grant opportunities in our region. Be sure to also speak with your local Rotary club as many clubs are invested in supporting local education initiatives. EdTechTeam Student Device Grant: One of the best emails I received recently had the subject line, "Your Student Device Grant Application was...Selected!" Months earlier, I enlisted the help of my tenth grade students and together we put together a video and responded to a couple of essay prompts about how adding a class set of Chromebooks would change our classroom. Perhaps my second favorite email was the one that followed a short couple of weeks later which began "Chromebooks have shipped!" I look forward to sharing with you all the innovations that come from our one-to-one Chromebook classroom. Voya is awarding 100 $2,000 grants for innovative classroom projects. But hurry! The Unsung Hero award deadline is April 30th.